Sustainable living is a lifestyle that attempts to reduce an individual's or society's use of the earth's natural resources and personal resources. Practitioners of sustainable living often attempt to reduce their carbon footprint by altering methods of transportation, energy consumption, and diet. Definition from Wikipedia. The concepts of sustainability and sustainable development are popular buzzwords. How to apply the concept of sustainability is a frequent topic of intense policy debate concerning how to produce safe and affordable energy, while ensuring protection for human health and the environment. It is common to look at these concepts primarily in terms of reducing carbon emissions, or carbon footprint, but often the practical side of sustainability is much more difficult to examine. The farmers, engineers and scientists who work with and for EEIF have lived a sustainable lifestyle with a relatively small carbon footprint for many years. This section of our webpage provides several stories and practical lifestyle changes that can help reduce one’s personal and/or organizational impact on the environment The EEIF team, composed of farmers, engineers and scientists, have learned these practical lessons on sustainability from practical application, and the “school of hard knocks." Practical Sustainability learned in the middle of “coal country” – Chris Hardin, P.E. 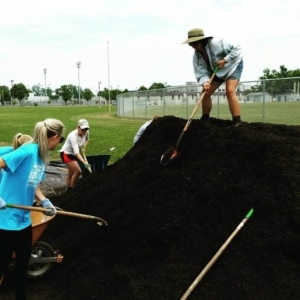 The week that Pope Francis’ encyclical on the environment was released I was in the middle of Southeastern, Ohio and West Virginia cleaning up coal ash ponds. As a father of four, a part-time organic farmer and environmental engineer I was excited about what the encyclical on the environment or Laudato Si could mean for our world and our children. As a practical engineer, I know it is not easy or possible to address most environmental impacts quickly. Contamination or sins against the environment take time to remediate. Any farmer who cares for the land and works hard to raise healthy food, realizes that we are not truly in control. Farmers know that their success and livelihood is highly dependent on interpreting the signs and messages provided by weather, soil, bugs and plants. A good father has similar qualities. Raising healthy, holy and happy children is not easy. It requires adapting to circumstances, and carefully listening to the needs of your wife and your children. Success as a farmer and father requires being strong enough to work hard, while also being patient. It requires wisdom to adapt quickly and respond to a wide variety of potentially negative influences that could hurt “the soils or the crops” of life that are essential for your family. No Easy Solutions, Except to Live a Simpler Life. As a farmer and engineer I know that quick or simplistic solutions will have little long-term impact. Things will not change until we deal with the root causes of pollution. New laws and global agreements alone are not enough to make a difference unless people have an interior conversion about caring for our Common Home. Excess waste, uncontrolled emissions to the air are directly connected to our throwaway culture, and a lack of concern for the earth and the more vulnerable human beings closest to us. To be able to respond properly requires listening and learning to develop the best solutions instead of a reactionary approach. For example, quickly eradicating all coal combustion energy without considering a balanced energy portfolio can do little to improve the global environment and result in a substantial loss of jobs for blue collar workers. Even though there is a critical need to discover cleaner ways to extract and use fossil fuels, our societies must also consider the lifecycle impact of all forms of energy. Wealthier countries consuming less resources and offering practical assistance with emission controls and environmental management to poorer countries can curb climate change and reduce pollution. All of these solutions are consistent with the ecological spirituality outlined in Laudato Si that was written by Pope Francis. Is there a chance that one cause for the indifference about damage to our Common Home is our inability to connect and listen to those who have different views? So what can an individual, family or small business do in the mean time to start their own “bold cultural revolution” outlined in Laudato Si? 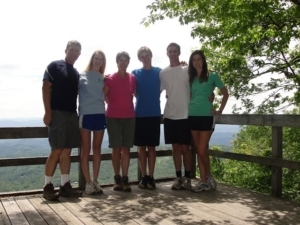 Our family had just returned from a wonderful vacation to Whitetop, Virginia in the Summer of 2012 where we got our fill of riding bikes the Creeper Trail, hiking a few mountainsides and meandering through quaint towns and the hidden lifestyles of small farms and country people. We made a couple of observations about sustainable living which I thought were interesting. Amongst the numerous dairy and Christmas tree farms were so many small country houses. Probably 90 percent of these farmers had vegetable gardens on their property. Most of the plots were average in size - enough room to provide vegetables for a family's summer needs as well as pantry and canning supplies. The houses were located on winding mountain roads, far removed from grocery stores. If the cook needed an onion, a trip to local Harris Teeter wasn't going to happen. Having a fully stocked pantry and freezer would be necessary during those snowy winter months. Most city families that I know wouldn't be able to produce a meal without going to the grocery store at least once a week. Us city-folk rarely think, plan and act ahead for our provisions. Sarah is a friend of mine who grew up in a small mountain town in West Virginia. She told me an interesting story about being prepared for any kind of weather. Whenever a storm threatened her town, a normal practice was to fill the bathtub with water. If the electricity went out, the well couldn't operate. The water in the tub would keep the family going with their basic needs until the lines were fixed. Even as a married woman living in Charlotte, Sarah continued to take this precaution until her husband explained that filling up the tub wasn't necessary in a large city. Preparedness and self-reliance had become second-nature to her, as I'm sure it is to those whom we passed on the way to our cabin. Another interesting observation we made was concerning the crops grown in the more mountainous terrain. While the Catawba area gardens are brimming right now with squash, cucumbers and beans, the mountain area gardens are filled with cooler crops of cabbage, onions and lots and lots of potatoes. Any corn I saw was ankle high, while mine is mid-thigh right now. It was a very vivid example of different climates producing different vegetation and planting calendars. Even though the Catawba area gardeners have to deal with hard, red clay, we are fortunate to have such a long growing season which produces crops long into the fall. These stories and others like them demonstrate that sustainable living is often a matter of common sense, planning ahead and then listening to the weather and changes of seasons. Homegrown in Charlotte, NC the worst thing in the world was when my mom told me we were going to weed the flower beds (of all things). I could never understand why this had to cut into my coveted Saturday morning playtime. 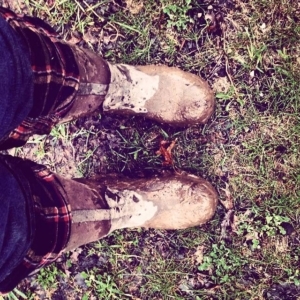 “Put your boots on, it could be muddy!” She’d say. The last 4 years I’ve had my muddy boots on farms of all shapes and sizes. Volunteering on an educational, livestock farm in Central London (pretty wild site), WWOOFing in eastern Iceland, being an Apprenticeship on a 250-member CSA farm in northwestern Pennsylvania, working as an Urban Farm Manager at a non-profit urban farm in Charlotte and learning to make cheese at a goat dairy in Waxhaw. Most recently, I started my own business offering consultations, installations and custom maintenance plans for people wanting to grow food in small spaces on their own. What did I learn about sustainability through this process? To keep pushing the envelope. To take things one step further, but in constructive and practical ways. To reflect and consider my steps carefully. To try to have a vision for the end goal but more importantly to have “common sense” steps to achieve the end goal. Common sense is critical component of sustainability. If it doesn’t make sense or isn’t practical then it won’t last. This means that things may not happen as quickly as you want them to but the goals you do achieve will be long lasting and provide a strong foundation to build on. You may have roll up your sleeves, feel comfortable getting dirt under the nails and a little sweat on the brow but that doesn’t hurt. We learn from the hard work. We remember the callouses and they will make you stronger, more viable and teach you to respect any system within which you work. My chosen systems to work as an agent of change are environmental responsibility and stewardship, the local food system and sustainable, organic agriculture. Learn about where your energy comes from.Energy production, heating and cooling tend to be some of the largest users of energy and produces approximately 30 percent of the industrial waste that impacts our world. Using less energy and living more simply is a great way to create more peace and care for our Common Home. Recognize that environmental impacts are much bigger than carbon emissions.Even though governmental organizations are vigorously debating the negative impacts of carbon emissions, how to address these impacts is much more difficult. Environmental impacts can be measured in many ways. Destruction of habitat and impacting rivers and water resources are near term indicators of impacts to our earth that are often more damaging. Looking at these other environmental impact indicators often guides us to practical, local and near term problems and solutions. Learn about where your food comes from. Most of us in America don’t realize that the majority of our food comes from over 800 miles away. The reason is simple, we have a highly efficient and industrialized food production and transport system that makes it easier and sometimes more cost effective to harvest and transport food large distances. The problem is that this industrialized food system often causes significant impacts to the environment, and disconnects us from the wonder and joy of knowing the local farmers who can provide us healthy, local food. Take the time to read Laudato Siand/or recent summaries by Fr. James Martin, SJ, and other practical Catholic and Christian business leaders. Learn to live with less.One of the best ways to care for the earth, love God’s poor and obtain greater peace in one’s life is to learn to live with less. Laudato Si explains the evils of our “throwaway culture” and “consumption lifestyles” and how these make us less human. Living with less, causes us to s l o w d o w n and allows us to sense the peace of Christ more often. Learn to work with someone who has a different view of protecting the earth.Many of us live and work with people who have the same political, technical or social view of caring for the earth. The more we work together with people to solve the problems, the more we are working to solve the root cause of damage to our Common Home -- human selfishness. Take time to pray and spend time in nature. This is a common theme throughout Laudato Si, is something that can easily be missed. Pope Francis and St. Francis of Assisi “connect” to God with and through nature. Seeing and sensing God through prayer and nature, makes us happy and more human. Take the time to get to know a friend who is poor, or a farmer or understands the earth.People who are poor and/or farmers who live close to the land are more grounded and uniquely dependent on God for daily life.